Inside Content Browser you can select asset and chose Show In Explorer. Basically every asset in UE4 is a binary file that can be copied to other projects without a problem. You can copy whole folders as well. Then just copy the asset to your project Content folder. I’m copying Characters and Animations folders directly to my Content folder. 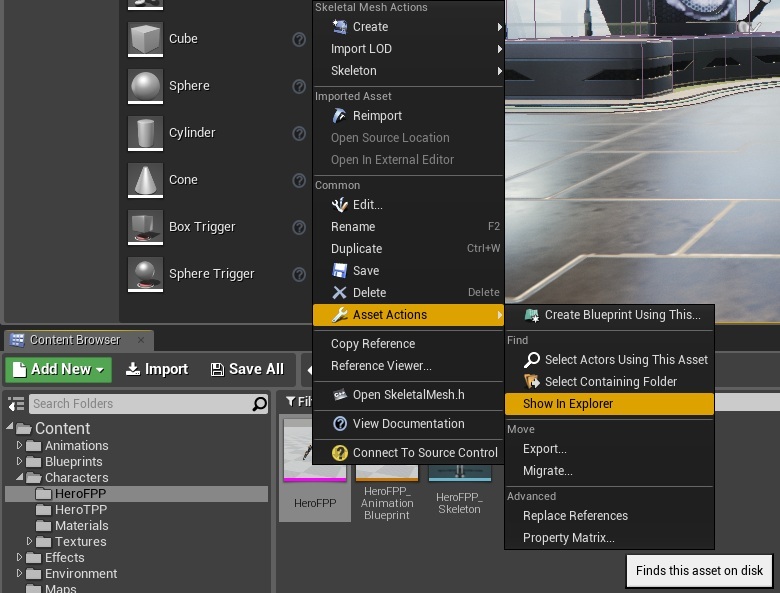 Thanks to that I don’t need to open every asset (material, static mesh etc) to change assets directories. Basically materials have links to textures, static meshes have links to materials and so on. They have hard-coded link starting from Content folder. If you are copying whole folders – links will work but if you are copying single asset to different folder you will need to open this asset and change links. If you copied something to your project you need to restart editor to load new assets. Epic gave us a lot of examples with free assets. You should use them when prototyping!